In October 2008, Craig and I bicycled the entire Katy Trail in Missouri. I’ve recorded our adventure here in case you’d like to vicariously join us from the comfort of your computer chair. But hopefully you’ll be encouraged to consider a future bicycle tour of your own. The plan was to ride our bikes down to the St. Louis Amtrak Station. Take the train out to Warrensburg, MO. Then ride 35 miles down to Clinton, MO, the west end of the Katy Trail. Then take five days to ride the entire Katy Trail back to our home in St. Louis. This would add up to 298.5 miles altogether. Our goal was to go from 45-70 miles each day. That would normally be a lot of miles per day for us but we didn’t think we’d have any trouble on the flat Katy Trail. We are self-supported tourers which means that we carry all of our camping gear and food on the bikes with us. We’d planned this trip for over a year and have slowly acquired all of our gear. 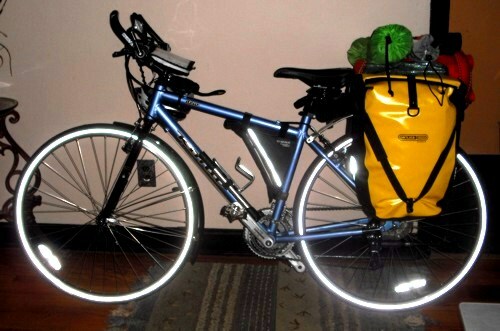 Here’s my Kona Dew all loaded up the night before our trip. I’m carrying two waterproof Ortleib Panniers on the back with my sleeping bag, Thermarest mat, camp stool, flute and jacket all bungeed to the back. This added up to about 50 lbs of gear. Oi! 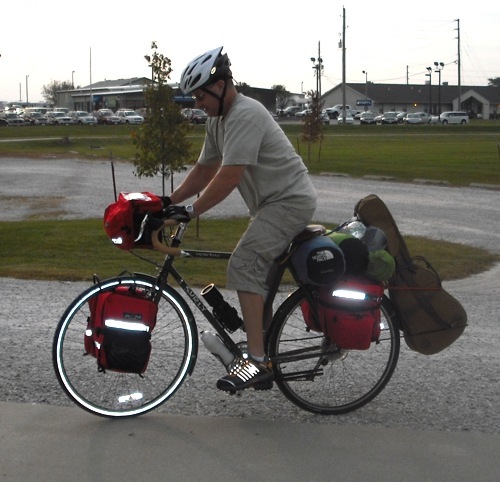 Here’s Craig in action on his Surley Long Haul Trucker with front and back Lone Peak panniers and handlebar bag. He’s got our tent, his sleeping bag, Thermarest mat, camp stool, and doumbek (a small handdrum) bungeed on the back. He’s also got my new Baby Taylor guitar strapped to the back. We had a custom steel rack built just for that guitar by Doug Jenkins Custom Hot Rods. Doug’s a friend of mine and all around great guy so he gave me a good deal. Yes, Craig is carrying more than me. He’s a strong guy! Probably about 65 lbs of gear.